Flash dryer gives you a full larger curing capacity as well as a possible quicker flash time between colors. 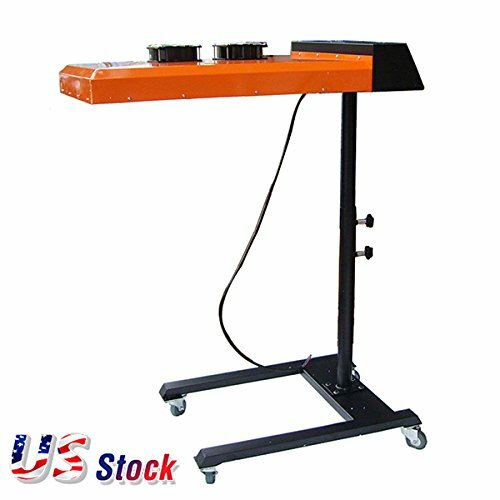 It can easily cure ink for silkscreen printing, can be used to flash dry your prints, and process the final curing of your garments. The flash dryer base is compact, and will not tip over if bumped. Stop curing shirts with a heat gun or an oven get this flash dryer and start drying your products the right way. 1.Heating Area: 20" x 24"
In US stock, Quality Guaranteed! Limited Quantity! Be Quick!!!! The Products in US Stock Only Free Shipping to USA. Canada and Mexico Customers need to pay the extra delivery charges, Please contact our customer service in advance. Note: This machine has no plug. You need to wire it by yourself. Flash dryer gives you a full larger curing capacity as well as a possible quicker flash time between colors. It can easily cure ink for silkscreen printing, can be used to flash dry your prints, and process the final curing of your garments. The flash dryer base is compact, and will not tip over if bumped. Stop curing shirts with a heat gun or an oven get this flash dryer and start drying your products the right way.